The CAJM works closely with the Jewish communities of Cuba to make their dreams of a richer Cuban Jewish life become reality. CAJM members may travel legally to Cuba under license from the U.S. Treasury Dept. Synagoguges & other Jewish Org. also sponsor trips to Cuba. Become a friend of the CAJM. We receive many letters asking how to help the Cuban Jewish Community. Here are some suggestions. 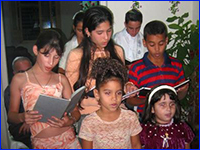 The Cuba-America Jewish Mission (CAJM) is a non-profit organization dedicated to assisting with the revitalization and sustenance of Jewish life in Cuba and working to improve the physical and spiritual well being of the Jews of Cuba, as well as new Cuban Olim (immigrants) to Israel. The Cuba-America Jewish Mission is a nonprofit exempt organization under Internal Revenue Code Sections 501(c)(3), 509(a)(1) and 170(b)(1)(A)(vi) per private letter ruling number 17053160035039. Our status may be verified at the Internal Revenue Service website by using their search engine. All donations may be tax deductible. Consult your tax advisor. Acknowledgement will be sent.